ALTools Valentine's Day Wallpaper Series-11 is themes & wallpaper software developed by ESTsoft Corp..
Valentine's Day is time for love, hugs, kisses, candy, kisses, chocolate, more kisses and all that good stuff! Decorate your PC desktop with ALTools desktop wallpapers to help put you in a romantic mood for your sweetie. Or put them on your sweetie's desktop as a fun surprise way to let your sweetie know that you love them. Cupid is ready to do some match making, two lovers are on Cloud 9, and two sweethearts have gifts of chocolate and candy! 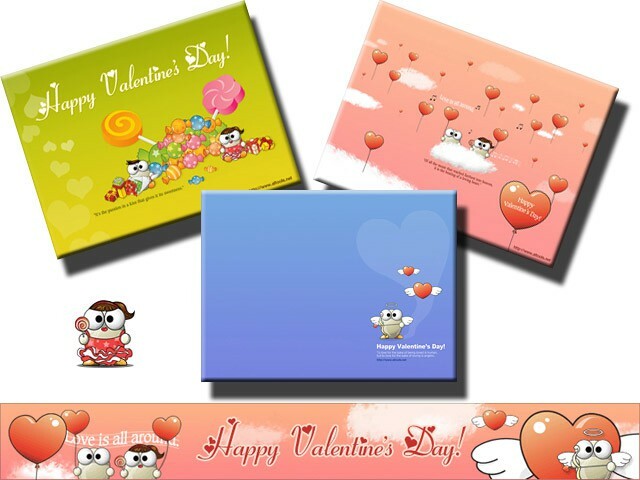 This themes & wallpaper software is freeware, which means you can download and use ALTools Valentine's Day Wallpaper Series-11 absolutely free. There's no need to buy the product. ALTools Valentine's Day Wallpaper Series-11 supports English interface languages and works with Windows 98/XP/Vista. We have tested ALTools Valentine's Day Wallpaper Series-11 for spyware and adware modules. The software is absolutely safe to install. We has completely tested themes & wallpaper software ALTools Valentine's Day Wallpaper Series-11 many times, written and published the interesting article and uploaded installation file (10245K) to our fast server. Downloading ALTools Valentine's Day Wallpaper Series-11 will take several minutes if you use fast ADSL connection. Adorable 3D Chocolate Kisses rise from the edge of a saucer to dance elegantly across a table top while a light and pretty symphony plays. Heart's advanced paricle engine offers three Valentine scenes to enjoy.